Breakfast at the Wire – where fans can enjoy a leisurely breakfast while watching Thoroughbreds train – returns for a fifth straight year beginning July 7 and continuing every Saturday through August 25. Sponsored by Toscanos Italian Grill, Breakfast at the Wire is located just past the finish line in front of the Trackside Deli—a perfect vantage point to enjoy breakfast while viewing the nearly 1,000 Thoroughbreds currently training at Emerald Downs. Breakfast at the Wire runs from 8 to 10 a.m. with entry via the Paddock Gate. The $7 price includes free parking and entry to the track, and a breakfast choice of scrambled eggs, bacon and hash browns, or scrambled eggs with biscuits and gravy along with giant cinnamon rolls and gourmet coffee from Rad Roasting Company. Hosted by Dean Mazzuca for a fifth straight year, Breakfast at the Wire features prominent guests from all facets of Thoroughbred racing, along with surprise visits from star jockeys and trainers at Emerald Downs. Other guests include veterinarians, stewards, assistant starters, association clockers, farriers, jockeys agents, and many more. Following the lead of Santa Anita’s Clockers’ Corner, Vicki Potter of Emerald Downs Group Sales has developed Breakfast at the Wire since its inception. Set to make his first start since finishing second in the Grade 2 True North on Belmont Stakes Day, multiple graded stakes winner Whitmore will kick off his summer slate in the Grade 2, $350,000 Belmont Sprint Championship on Saturday at Belmont Park. A Breeders’ Cup Challenge Series “Win and You’re In” race offering all fees paid to the winner for the Breeder’s Cup Sprint in November at Churchill Downs, the Belmont Sprint Championship is one of five stakes races on the fifth annual Stars & Stripes Festival card joining the Grade 1, $1.2 million Belmont Derby Invitational, Grade 1, $1 million Belmont Oaks Invitational, the Grade 3, $300,000 Dwyer and the Grade 2, $700,000 Suburban Handicap. National TV coverage of Saturday’s Stars & Stripes Racing Festival can be found on NBC from 4:30-6 p.m. ET followed by a special edition of Belmont Park Live from 6-7pm on FS2. After a successful campaign last year in which he won three graded stakes highlighted by a win the Grade 2 Phoenix at Keeneland, Whitmore kicked off his 2018 season with a win in the Hot Springs on March 10 at Oaklawn Park. 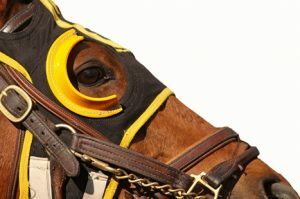 Following with a victory in the Grade 3 Count Fleet on April 14 at Oaklawn the 5-year-old gelding by Pleasantly Perfect entered the Grade 2 Churchill Downs on May 4 where he finished fourth. Most recently, he came up just short at the wire to lose by a neck in the Grade 2 True North on June 8. Posting two workouts since that race, trainer Ron Moquett said Whitmore is in top form. With Ricardo Santana, Jr. in the irons, Whitmore will leave from post 2. Looking to improve off a third-place in the Grade 1 Runhappy Metropolitan Mile is Limousine Liberal for owner Katherine G. Ball and trainer Ben Colebrook. A multiple graded stakes winner in his own right, the 6-year-old Successful Appeal gelding has one win from three starts this year, capturing the Grade 2 Churchill Downs in which he came from off the pace to win by a head. also besting Whitmore. He began his 2018 campaign with a second-place finish in the Grade 3 Commonwealth at Keeneland on April 7 and has an impressive four wins from nine starts, with two second-place finishes at the Belmont Sprint Championship distance of seven furlongs. Drawing the rail, Limousine Liberal will be ridden by Jose Ortiz. Leading Belmont spring/summer meet trainer Chad Brown enters Favorable Outcome for Klaravich Stables. The 4-year-old son of Flatter posted an impressive 102 Beyer Speed Figure in his most recent start finishing second in an optional-claiming race on May 17 at Belmont. Last year, he captured the Grade 2 Swale and finished third in the Grade 1 Malibu at Santa Anita. With Javier Castellano aboard, Favorable Outcome will leave from post 6. Rounding out the field is Eye Luv Lulu for owner Michael Dubb and trainer Jason Servis entering off a win in the Affirmed Success for New York-Breds on April 27 at Belmont; Shaft of Light for trainer Jorge Navarro and owners Al and Michelle Crawford Racing and Lewisfiel, for trainer Jeff Runco and owner Linda Zang. Last year’s Belmont Stakes hero Tapwrit will make his graded stakes return as part of a field of 11 in the Grade 2, $700,000 Suburban at 1 1/4 miles on Saturday at Belmont Park. Installed as Race 9 with an approximate post time of 6:18 p.m. ET on Saturday’s 11-race Stars & Stripes live racing program, the 132nd running of the Suburban will kick off a special edition of Belmont Park Live airing from 6-7 p.m. nationally on FS2 and regionally on MSG+, FOX Sports Prime Ticket and FOX Sports San Diego, and capped by the Grade 1, $1.2 million Belmont Derby Invitational. Tapwrit, a 4-year-old colt by Tapit for trainer Todd Pletcher, will be making his second start of the year following a third-place finish in his seasonal bow, a loaded optional claiming contest on June 3, where he finished 1 1/4 lengths behind Grade 3 winner Timeline. In 2017, Tapwrit recorded a victory in the Grade 2 Tampa Bay Derby in March of his 3-year-old season before competing in the first and final legs of the Triple Crown, capped by his two-length victory over Irish War Cry in the Belmont Stakes. Owned by Eclipse Thoroughbreds, Robert LaPenta, Bridlewood Farm, Gainesway Stable, and Whisper Hill Farm, Tapwrit was pointed to the Grade 1 Travers 11 weeks later at Saratoga Race Course, where he finished fourth, and was then tabled for the remainder of the year. Tapwrit will be ridden by Jose Ortiz from post 4. Among those leading the challenge are a pair from California-based Hall of Fame trainer Bob Baffert in Hoppertunity and Dr. Dorr. 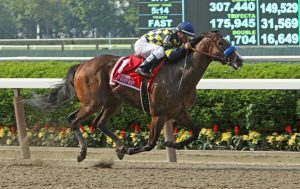 Hoppertunity is a perfect 2-for-2 at Belmont, beginning with a half-length win in the 2016 Grade 1 Jockey Club Gold Cup and continuing last time out with a 2 1/4-length score in the 1 1/2-mile Grade 2 Brooklyn on Belmont Stakes Day. 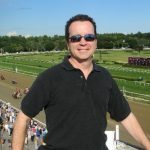 Owned by Karl Watson, Mike Pegram, and Paul Weitman, the 7-year-old son of Any Given Saturday owns a 9-7-5 record from 32 lifetime starts for earnings of $4,646,625 through five seasons of racing, including back-to-back victories in the Grade 2 San Antonio in 2016-17 and a half-length win in the 2014 Grade 1 Clark Handicap. Dr. Dorr, a speedy 5-year-old Lookin at Lucky gelding, is exiting a runner-up finish to Santa Anita Handicap winner Accelerate in the Grade 1 Gold Cup at Santa Anita on May 26. Hoppertunity drew post 8 and will have the services of his regular jockey, Flavian Prat. Dr. Dorr will leave from post 5 with Joe Talamo aboard. Rounding out the field for the Suburban are Lauren Evans and Ralph M. Evans’ 2017 Jockey Club Gold Cup hero Diversify, exiting a hard-fought win in the Commentator for New York-breds on May 28; The Lieutenant, a 5-year-old half-brother to Triple Crown victor Justify and making his first start on the East Coast following a one-length win in the Grade 3 All American over Golden Gate’s Tapeta course; hard-knocking multiple stakes winner War Story; Name Changer; Zanotti; Discreet Lover; Take Your Guns; and Sorry Erik.